Are you tired of my autumn cards? I actually did something totally different than the 4 in previous posts. I tried a sketch challenge over on Red Rubber Designs and entered their challenge. All stamps are RRD's and I'll provide the links in a moment (just click on the stamp name below the picture). I seen something like this spotlighting in a magazine when I was at the AZ Scrapbooking Christmas in July Retreat last month. 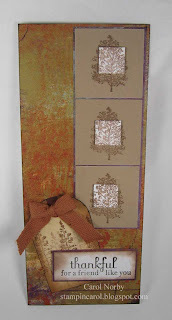 The 2 stamp sets I used are Tree Silhouettes and Joyful Notes. The pattern paper is called Winchester and I got it from The Angel Co. I used some neutral twill ribbon and my Bow Easy for the bow. I like how that little tool makes such a nice bow! This card was made to fit a #10 envy which is about 9 1/2" x 4". Very Pretty! Spotlighting is such a fun technique. Your twist on it is excellent!!!!! Very elegant fall card. 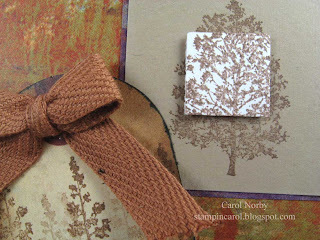 Love the trees overstamped on the blocks!